Steel manufacturing factories always bear an extreme working condition. Not only are the equipment used within the workplace are exposed to dust, heat and other debris, but also the operators themselves. That is why these factories use industrial-grade equipment to ensure that operations are performed efficiently. In the field of steel casting procedures, it requires a computing equipment that can provide precision and quality. With its extreme working environment, what type of device can withstand such kind of condition? Fortunately, industrial computing devices can have the capability to function over a wide temperature range. One of which is the S22 rugged industrial computer which is enclosed in a stainless steel construction frame, NEMA sealed. It can resist dust, dirt, and another debris present within the workplace. With its rugged features, the internal components of the system are well-protected, making it work efficiently even in these industrial processes. On this blog, know why these factories need to use the S22 industrial PCs in their operations. The steel casting process has a long and complex process. From core making, melting, moulding and final assembly, each operation should be precise and accurate. This is to make sure that high-quality steel products are manufactured. But, due to its increasing demand in the global market, the steel manufacturers use industrial computing devices to speed up the processes. So, modern applications for these steelmaking procedures are now being utilised by most steel plants. However, this application can only work efficiently in advanced computers. Good thing, the S22 rugged industrial computers are suited for the operations. This device can be built with a compatible operating system. Hence, tough applications like modern steel procedures can be installed and utilised in manufacturing operations. How can this device provide long-term availability to these operations? Let us check out some of its strengths and capabilities. Imagine how door handles and locks are made or how wheels and pumps are manufactured. These are only amongst the few products that are made of steel and it all starts with a casting process. Here’s how an industrial-grade computing system can be used in these operations. Casting of steel materials needs accurate data of steel products to undergo casting. This data must be input into the system to ensure consistency of quality. Now, industrial computing devices like the S22 industrial panel PCs are designed for industrial purposes. These devices come with a built-in compatible operating system. And, these rugged computers can have the capability to gather, store, analyse and transmit data from the main server to another computing system. So, any reliable data can be embedded in its system. With the advancement of technology, industrial PCs are now integrated to touchscreen technologies. Two of which can be featured on this device. These are resistive touchscreens and projected capacitive touchscreens. Both have touchscreen functionalities. Operators will just have to touch the icon of the application on the screen monitor to perform certain procedures. However, the most recommended touchscreen feature is the projected capacitive touchscreen as it is more responsive to touch. That is why an S22 industrial panel PC with projected capacitance is not only touch-enabled, but it is also resistant to external debris. Hence, it can perform well even in an extreme environment like steel manufacturing plants. Operations in the steel factories can be simultaneous and non-stop. So, there is a possibility that a computing system may fail to function effectively. But, industrial computing devices like the S22 rugged computers can have a built-in Watchdog Timer. This feature has the capability to monitor and record the internal conditions of the device. It can also detect and solve system errors that may cause the system fail to operate. Hence, a system failure can be prevented. 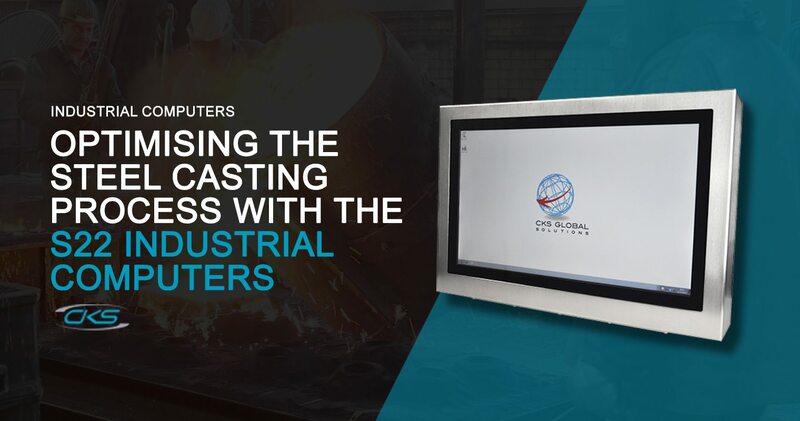 Steel plant manufacturers need to choose the right computing equipment for steel operations considering its existing extreme working environment. At the same time, a casting procedure must keep its consistency of producing high-quality steel products. So, opt for an industrial computing device like the S22 rugged industrial computers to optimise steel manufacturing procedures today.